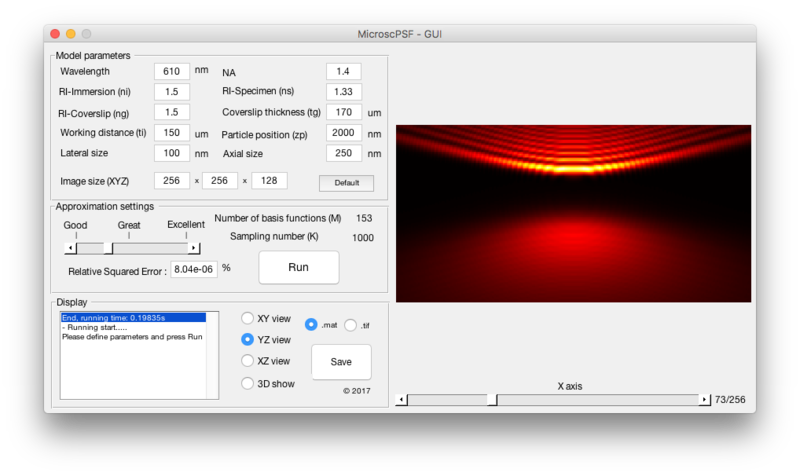 The point-spread function (PSF) of a microscope describes the response of this imaging system to a point source or object. A realistic and accurately calculated PSF model can significantly improve the performance of deconvolution microscopy and also the localization accuracy in single-molecule microscopy. where the phase term has an explicit expression involving several physical parameters, and denotes the Bessel function of the first kind of order zero. k is the wave number of the fluorescent light and NA the numerical aperture of the microscope. Two orders of magnitude faster than the quadrature approach (e.g., see PSF Generator) at same accuracy. Can be extended to other microscopy PSF models. Li, J., Xue, F. & Blu, T.,"Fast and Accurate 3D PSF Computation for Fluorescence Microscopy", Journal of the Optical Society of America A, Vol. 34 (6), pp. 1029-1034, June 2017 (Top downloaded article in Oct 2017). The Matlab code available here (220KB) is a demo that allows to generate and visualize 3D microscopy PSF based on the Gibson-Lanni model. To understand how to use these files, please read the file README.txt to understand how to start the demo. Conditions of use — You are free to use this software for research purposes, but you should not redistribute it without our consent. In addition, we expect you to include an adequate citation and acknowledgment whenever you present or publish results that are based on it.